The care kit contains one 4 oz container of LImmer Boot Grease, this should give you about 35 applications. The applicator brush which will allow you to apply small amounts of grease on all your leather pieces, getting the grease into the stitch areas or welt areas. The cleaning brush which you should use to take off any grit or dirt on your boots and also will reach into the welt area which is a working part of the boot. And the spare pair of heavy duty 54 inch nylon laces. 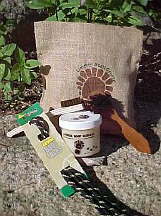 This kit should give you everything you need to take care of your boots, gloves, nail aprons any product made of leather. Please remember that the application of the grease will darken the leather.